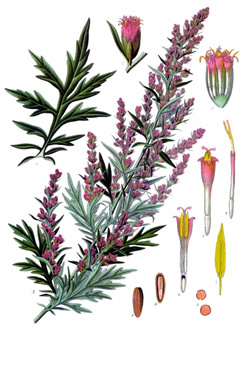 Mugwort is a bitter tonic that stimulates digestion, relieves gas and is more palatable than the closely related wormwood. This herb also acts as valuable tonic for women and as a relaxing sleep aid. Recipe Instructions: Herbal Tea :Use one teaspoon of herbal mixture to each cup of hot water. Infuse for 10 minutes in a covered vessel. Drink before or after meals to aid digestion, or take in divided doses throughout the day for delayed menstruation.